HONG KONG: Typhoon Hato left three dead in the gambling hub of Macau Wednesday as it brought chaos and destruction to the enclave after sweeping through neighbouring Hong Kong, where one man also died, reports AFP. Local media showed severe flooding had left cars underwater and people swimming in Macau’s city streets, with the territory’s mega-casinos running on back-up generators. The sprawling Venetian casino resort was on back-up power and without air conditioning or proper lighting, according to one source. Brian Chan, 31, said authorities had failed to give enough notice of the impending storm and were not properly prepared, describing the territory as “totally lost” in the typhoon. By evening, parts of Macau were still without power. “Some have no tap water supply. The city looks like after an attack,” Harald Bruning, editor of the Macau Post Daily, told AFP, describing it as the worst typhoon he had experienced in 30 years. 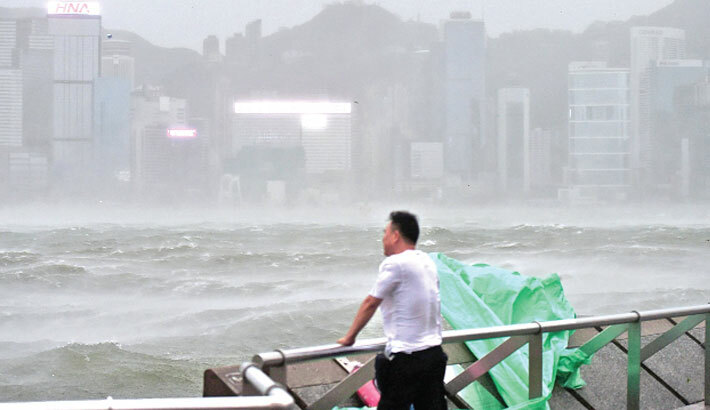 Hurricane winds and heavy rain had earlier hit Hong Kong, leaving an 83-year-old man dead after he fell into the sea, police said, and more than 80 injured. The typhoon shut down the stock market and forced the cancellation of hundreds of flights in the worst storm the city has seen for five years. Meteorologists raised the Hong Kong’s most severe Typhoon 10 warning as the storm hit, only the third time in the past 20 years. The typhoon passed as close as 60 kilometres (37 miles) and made landfall at noon (0400 GMT) in the southern mainland Chinese city of Zhuhai. Thousands of people were evacuated Tuesday in parts of south China in preparation for the typhoon’s arrival, the official Xinhua news agency said.